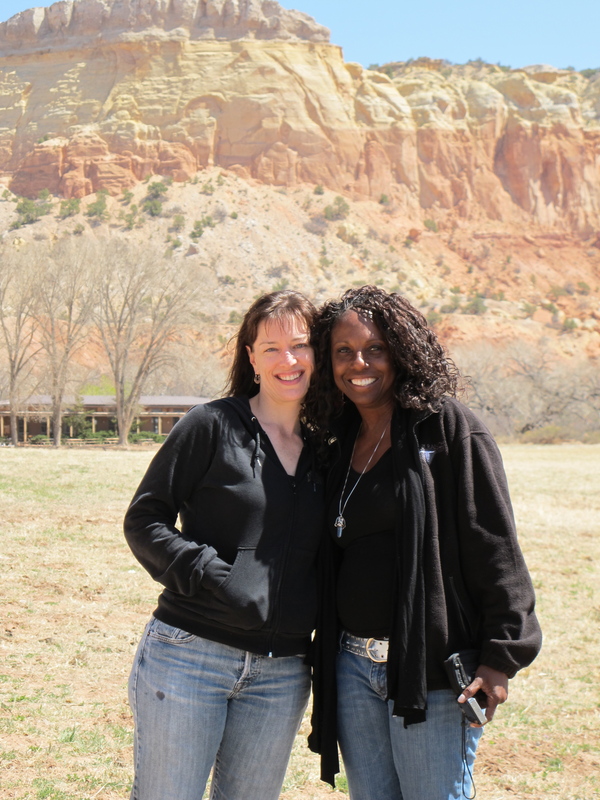 I came to Ghost Ranch because my friend Greta lives here. Georgia O’Keeffe used to live and work here. Her house is not available to the public but I got to go see it, though I couldn’t go in. The big window on the right is her studio space, facing the open valley. 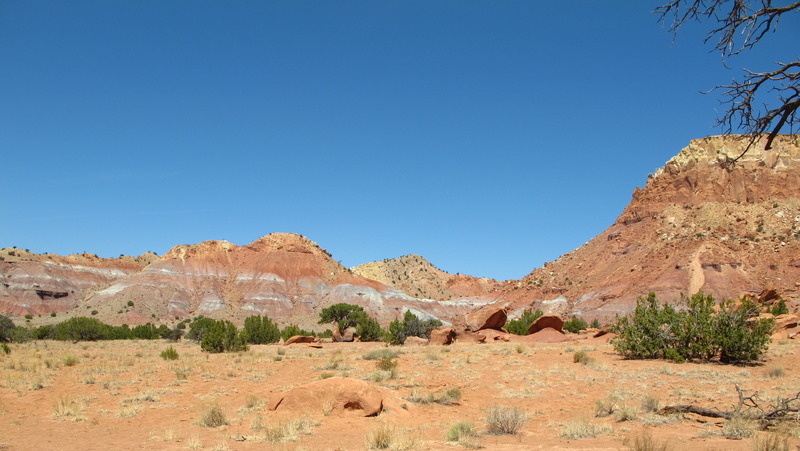 The surrounding cliffs are gorgeous, high plateaus of red rock and wide valleys of green shrubs, blue sky arching over all of it. Stunning. 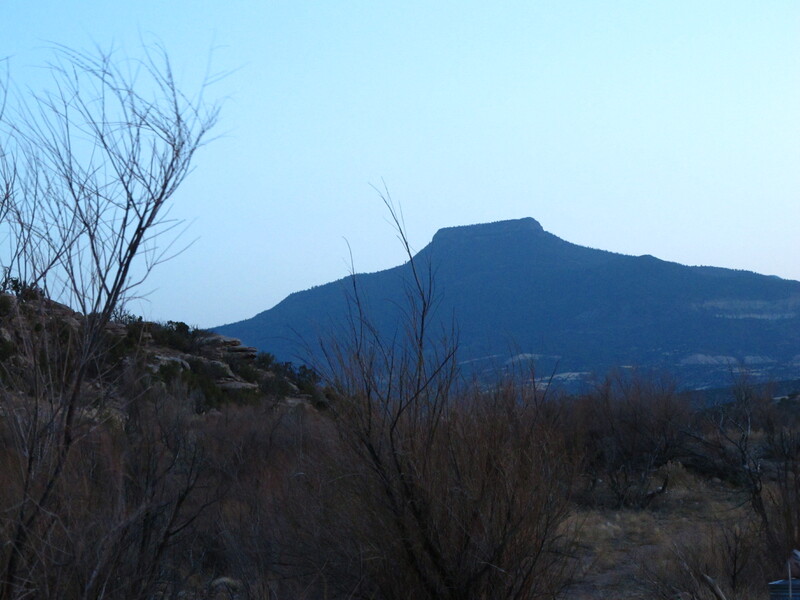 The best parts of the New Mexico landscape. Georgia loved this landscape, a couple of mountains in particular. She said that she painted Cerro Perdernal so much that she hoped God would give it to her. 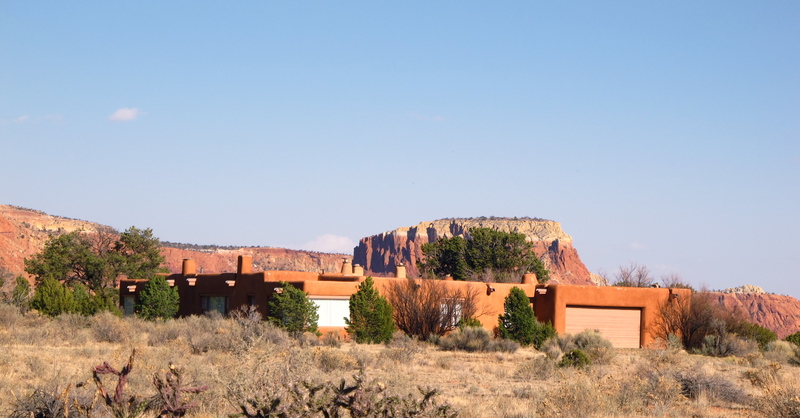 Now Ghost Ranch is a business complex. Artists come to work and hold workshops on their specialties, groups of people use the grounds for conferences and individual people come to connect with the desert and to heal themselves. This place is deep. 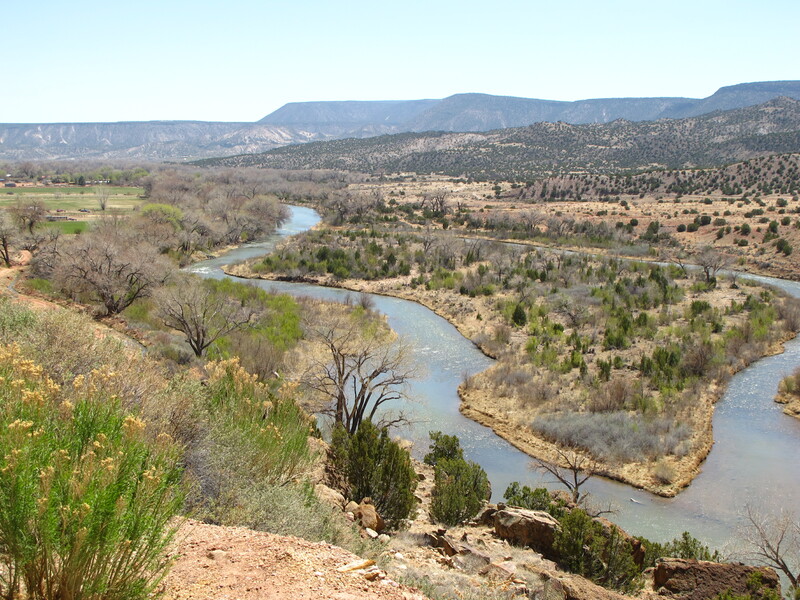 The sacred River Chama runs right through this canyon and you can feel the vastness and stillness of the desert here. You can see how the light changes every time I take a picture. We spent a great night watching the sunset over the River Chama, talking about our writing and our futures. I woke up to a lazy morning, of which I haven’t had many, and spent it with coffee and writing. 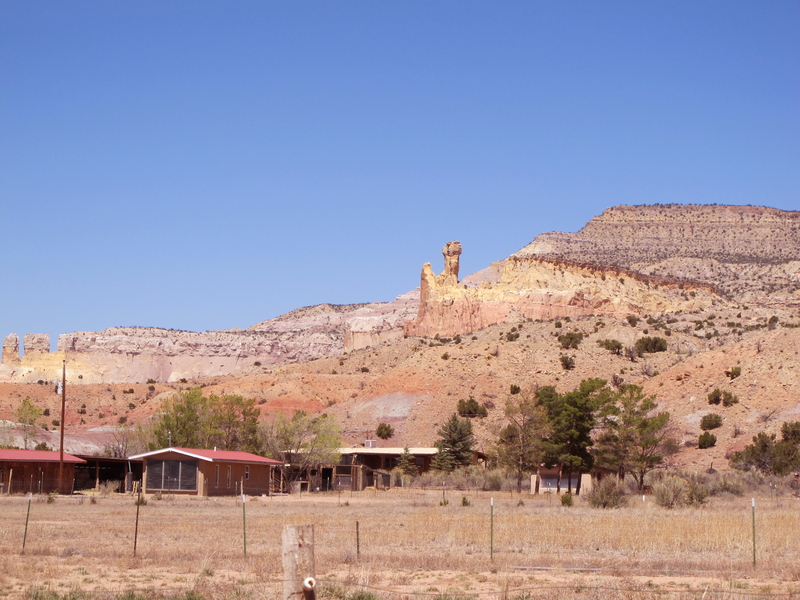 I left reluctantly and got on the road about noon to head up to Chimayo, NM. 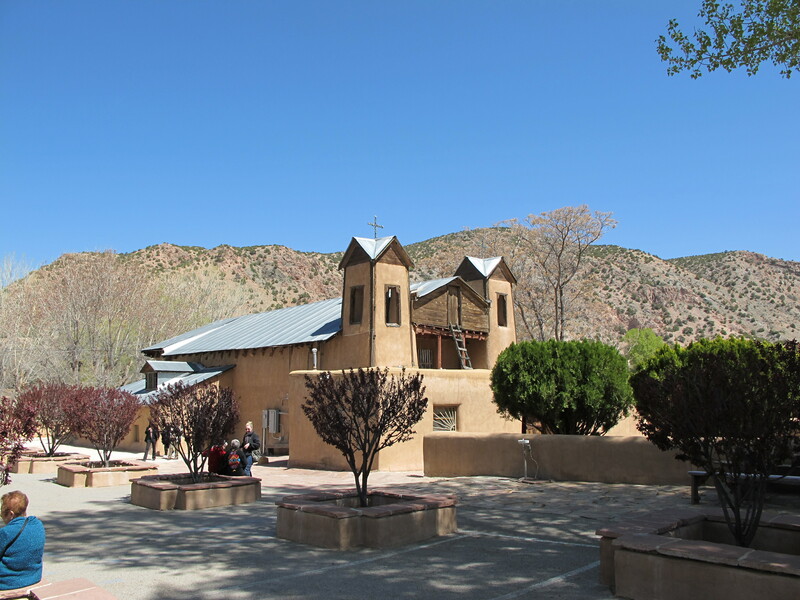 Chimayo is the site of a shrine called the Lourdes of America because the location is said to be a place of healing. In the early 1800s a monk named Don Bernardo saw a light shining from the hills and when he went to investigate, he found a crucifix. He took the crucifix to his church in Santa Clara and in the morning the crucifix had disappeared. He went back to the hills and found the crucifix in its original spot and again took it back to his church in Santa Clara where it again was gone the next morning. 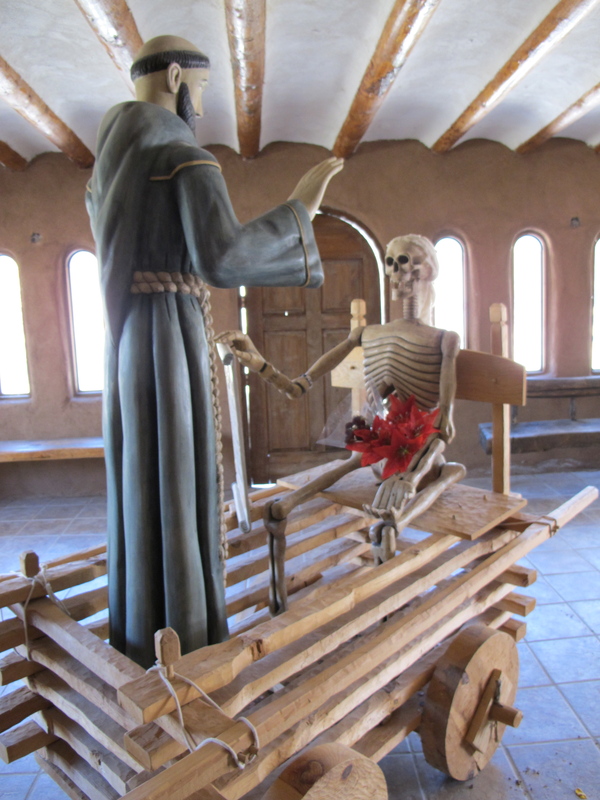 After this happened a third time, the monks built a chapel over the crucifix in the hills and Chimayo was born. For 200 years this place has healed pilgrims. The spot in the dirt where the crucifix returned 3 times is said to have magical properties and the monks built a “dirt room” over that hole in the floor. Sick people make pilgrimages from all over the world to take the sacred dirt, put it on their ailing parts and receive healing. The antechamber of the dirt room is inspiring and heart breaking. Pilgrims leave mementoes of their sick loved ones, especially kids because this shrine is dedicated to the Santo Nino, and there are hundreds of pictures of sick kids and shelves of baby shoes with names carefully printed on them. It makes my heart hurt to think of all those parents bringing their kids here to pray for a miracle. But then there are also mementoes of healing, rows of discarded crutches and walkers and shelves of casts, glasses and braces. Unfortunately, I couldn’t take pictures inside the chapel area. But I spent quite a long time there, breathing in all this evidence of faith and wondering how belief works, exactly. We know it works. We’ve seen it work. There are many powerful and famous people who came from “the wrong side of the tracks” and never should have accomplished anything given their surroundings and their options; but they had parents or mentors that believed that they were worth something and were proven right. Whatever you may think about miracles or faith, even scientific studies show that sick people who believe they will be healed are more likely to be healed than people who think they’re done for. The book The Secret is all about the power of belief. What you put out there comes back to you. 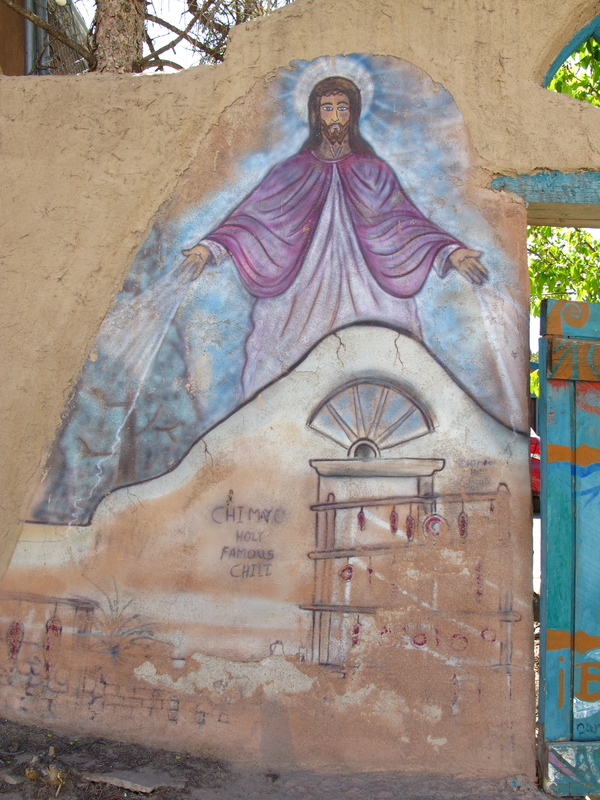 Is it the power of the dirt in Chimayo that heals? I don’t know. But I believe in belief. I think that if you think something is true, you act like it’s true. When you act like it’s true, you have a better chance of making it true. Faith is a powerful thing and the collected faith of many people is an even more powerful thing. I think places and stuff can soak up the concerted energies of people, which would make Chimayo a powerful place given the 200 years of directed faith and prayer. So I took some dirt. 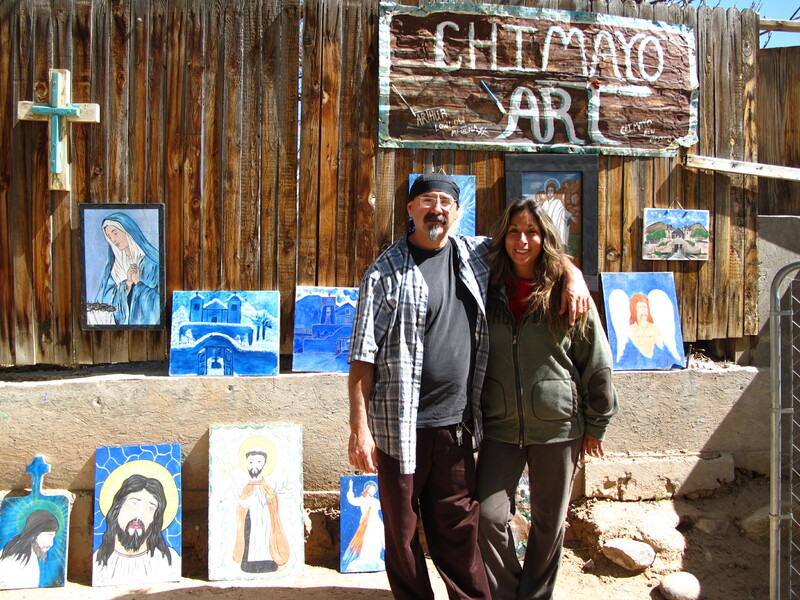 And then I wandered around the small pueblo of Chimayo and met local artists Lowlow and Joan. Joan makes jewelry and Lowlow paints paintings and lowrider cars (thus the nickname). He also makes crosses out of barb wire with local turquoise woven into them and calls them the thorn crosses of the Chimayo Santuario. They’re cool and I bought a couple at the chapel gift shop and then went over to his studio. Lowlow’s paintings are either sacred or secular, crosses and Christ vs. lowrider cars and babes. It’s an unusual combination in one artist. He has an open air gallery to displays his paintings outside because he likes the way the wind and sun weathers the paintings, streaking the paint, fading certain areas and intensifying others until he gets a slightly different product than he set out to create. He was born and raised in Chimayo and I think the spirituality of the location and a childhood raised around pilgrims gives him a unique view of the world. I bought one of his little weathered icons and when he asked me where I was from and I shrugged and said “everywhere.” He grinned and said “that’s cool” while his wife laughed and said “that’s the best answer you could have given him!” On my way to meet Lowlow, I’d gotten scooped up by his brother, Carlito, who fed me some pistachio nuts and spices and talked me into buying some chilies. Clearly the family is fascinating. I’d love to be around a big Medino family gathering and see what goes down. When I left Joan directed me out of the driveway and then gave me a blessing and asked me to pray for the “spirit of God to flow everywhere because we need it!” I agree. I spent the rest of the day driving up and down mountains headed for Miami, AZ and my brother Nate. After 7 hours of intense driving, I got to Globe, AZ, pulled over to GPS his address and then headed down the main street. About 4 blocks later a giant flash interrupted my navigation and I realized I’d just gotten busted by a speeding camera. I checked my speed and I was going 42 and hadn’t seen a single speed limit sign. When I saw one on the next block it said 30. And then I saw the red and blue lights of a cop that had just pulled someone over. 2 blocks further on I saw another cop pulling someone else over. Meanwhile the speed limit changed 4 times in the space of 2 miles, from 30 to 35 to 45 and then back to 35. That kind of thing feels like a set up. I got quite aggravated about the potential speeding ticket because I’ve been careful about my speed this trip, even knowing that I’m in a rental car with NYC plates that traces back to mailing address in AZ where I don’t actually live. When I finally got to Nate’s place and told him the story – dramatically – ending with “And what’s that about?” And “How are they going to find me? “ and “I drive across the country with no problems and get busted by a camera in Globe, AZ? Really?? ?” Nate put up his hands at the verbal onslaught and said “whoa, whoa whoa! You got lucky. The cameras were installed a week ago and everyone in Globe gets a month grace period to get used to them. You’ll might get a picture but you won’t get an actual bill or ticket.” So I just got a free pass. But I might get a pretty pretty picture of me looking intently for street signs while holding my GPS after 7 hours on the road. G-L-A-M-O-R-O-U-S.
And now I’m in Miami, AZ at the beginning of the Boomtown Spree. I hear there are mining sports tomorrow like mucking and hand drilling. Sounds fascinating and I’ll report back, dontcha know. With pictures. This entry was posted in New Mexico, Road Trip 2011 and tagged driving through the Salt River Canyon at night is a shame, Georgia O'Keeffe had gorgeous views to paint from, Ghost Ranch and Chimayo have a lot in common though the energies are totally different, I believe in faith, I loved the energy of Chimayo, Santo Nino. Bookmark the permalink. wow ..amazing clicks…I would like to know if can use the first mage in my video for a course on creativity on udemy.In the video I talk about Georgia O’Keeffe’s life and her works.It would be of great help if you could let me use the image.The image will be flashed for fraction of second in the video.Thank you. yes, go ahead and use it. Just credit me. Thanks! sure ..thank you so much !